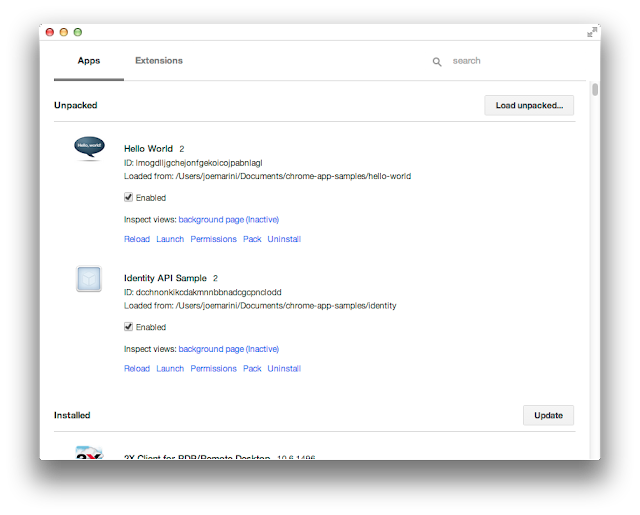 Apps and extensions are now listed in separate tabs, reducing the potential for developer confusion and reinforcing the difference between the two item types. This also reduces the size of each list, making it faster to scroll through. Unpacked items and installed items are now listed separately, which makes it much easier to quickly see and access your works-in-progress. You can individually update specific apps and extensions with one click, instead of having to update all items at once like in the old tab. The common actions for each item, such as reload, launch, view permissions, pack, and uninstall, are located right next to that item for fast access. The list can now be live-filtered using the Search box at the top right of the page instead of having to use the regular “Find in page” feature of Chrome. If you’re developing Chrome Apps or extensions and you have at least the latest version of Chrome Beta installed, get the new tool today and send us your feedback on our G+ Developers page or our developer forum.